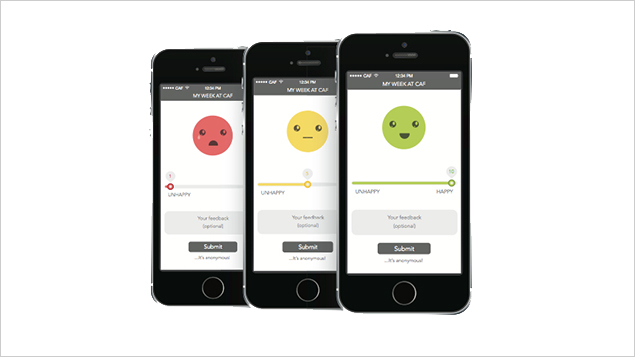 Employees can record their mood via a simple app interface. Employee engagement surveys tend to be infrequent and workers are not always honest. So, could a new app be better at gauging the temperature of the workforce? A “happiness app” may sound like something out of a science fiction film, but one group of developers believe that it could revolutionise how we measure employee engagement. The app is the brainchild of the Chelsea App Factory (CAF), a 77-person company that develops mobile applications for big-name customers including Waitrose, KPMG and Ladbrokes. It claims to be a fresh version of the annual employee satisfaction survey, but the big difference is that it has been dragged into the twenty-first century and made weekly. The result of a bi-annual “hackathon”, where developers are given a day’s freedom to come up with ideas and then code them up, it comprises a screen with one happy and one sad face, and a slider in between to show the emotion being felt on a scale of one to 10. Beneath it are two little boxes asking: What have we done well this week? and What could we have done better? Participation is not mandatory and it is not necessary to answer any, or all of, the questions. The aim, according to Nick Yockney, head of HR at the the four-year-old organisation, is simply to “give employees a voice”, should they want one. The app was introduced at the start of this year across the company and it has an average response rate of 95% each week. Managers review the data each month and founder and chief executive Mike Anderson provides feedback at the firm’s regular three-monthly town hall meetings, where he talks about what actions are to be taken. The aim is to assess the app’s performance this autumn and then make a decision about whether or not to commercialise it and sell it on to other organisations. This means that a happiness app could soon be winging its way to a phone near you.